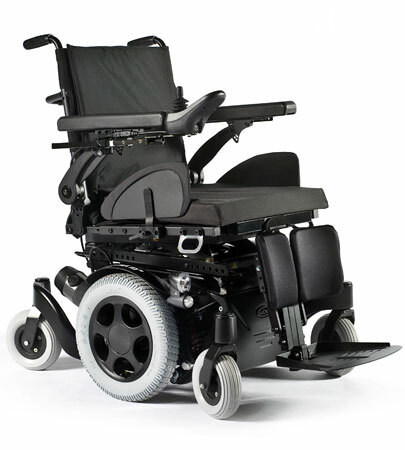 The new QUICKIE Salsa-M2 powered wheelchair effortlessly balances superb indoor maneuverability with outstanding outdoor performance and sleek design. With an ultra-compact turning circle and base, it's great for narrow or confined spaces. Getting under tables or in/out of vehicles is easy with its lower-than-ever seat to floor height (from 43 cm). When outdoors, You're always ensured of a smooth and stable ride with the all-wheel suspension and anti-pitch technology - not to mention a stylish ride with 4 eye-catching body colours and a beautiful design that's sure to turn heads. 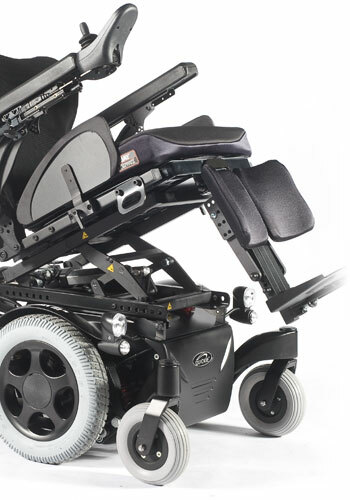 Thanks to its mid-wheel drive technology, the Salsa M2 powered wheelchair can turn on its own axis, giving an ultra small turning circle that provides excellent indoor manoeuvrability, so trouble navigating around tight spaces and furniture will become a thing of the past! The compact dimensions of the base also allows for great access and control through narrow doorways or confined spaces. Plus, with the lower than ever before seat-to-floor height (starting for 43 cm), you'll easily be able to fit your Salsa M2 under those low tables or even into vehicles. Enjoy getting out-and-about? 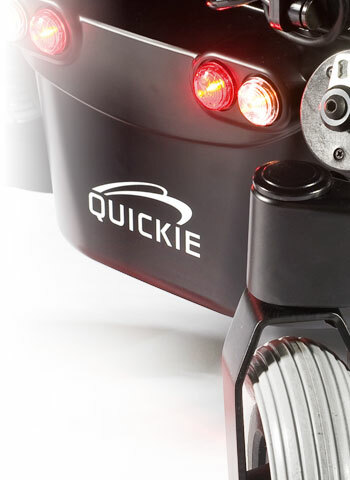 Then you'll love the smooth and stable ride that's provided by QUICKIE's patented all-wheel suspension. 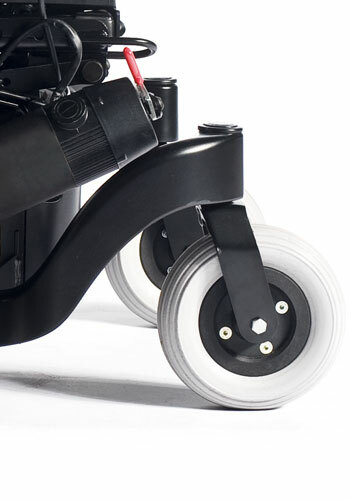 All 6 wheels are independently suspended to easily absorb all of those awkward, bumpy journeys. 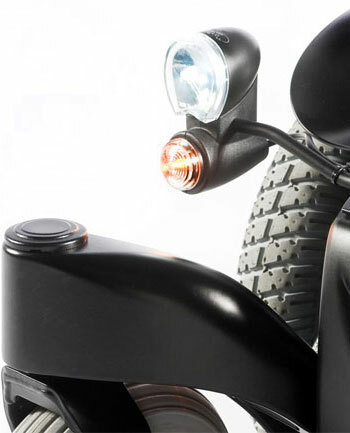 The anti-pitch technology also eliminates pitching on slopes and the position of the seat directly over the drive wheel increases traction for better all-round outdoor performance. It's not just QUICKIE's hallmarks of a beautiful streamlined design and assertive stance that turns heads, you can now stand out from the crowd with a selection of 4 body colour options. Choose from classic white, elegant red, electrifying blue or admire the super sleek lines with matt black - there's a colour to suit any occasion and taste. The optional 120Ah controller gives the Salsa M2 powered wheelchair the choice of speed, torque and outright performance that you need when outdoors. 6 mph is easily achieved thanks to the powerful 4-pole, high torque motors. Need more miles per charge? Take advantage of the ultra-efficient 4 mph speed option. Both are powered by 60Ah batteries that deliver 10% more range than the original Salsa-M Powered Wheelchair! Unparalleled performance and head-turning style shouldn’t mean that you’re forced to compromise on your powered wheelchair's practical requirements. That's why the Salsa M2 combines proven ultra-compact mid-wheel-drive design with enhanced functional benefits, including a powered seat lift of 30 cm, powered seat tilt of 0 to 30 degrees and effortless kerb climbing of 7 cm kerbs. Plus, the flip-back armrests provide easy transfers in and out of your Salsa M2 and closer access to tables. The fold-down backrest also lifts off for a more compact size for storage or portability. Customise and make it your own! Truly personalise your QUICKIE Salsa M2 powered wheelchair to your own individual tastes with Built-4-Me customisations. From personalised styling such as custom shroud and upholstery colours to performance options - almost anything is possible!